Ford unveiled its all-new 2020 Ford Explorer at a special reveal event a week before the 2019 Detroit Auto Show. Ford is no stranger to the Ethisphere Institute’s List of World’s Most Ethical Companies. For decades, Ford has been dedicated to making a positive impact in the global community through strong corporate citizenship. And every year, that commitment deepens. That’s why we are tremendously honoured to be celebrating another year on the Ethisphere Institute’s list of top performers. It’s true – as of 2016, we have been honoured 7 years in a row and have the distinction of being the sole auto manufacturer on the list. Each year, the Ethisphere Institute, a global leader in defining and advancing the standards of business ethics, assesses companies based on their ethics, corporate citizenship, leadership, and reputation. Ford is one of 131 companies to make 2016’s list of top companies. You can learn more and see the full list of winners here. Ford started something back in 2007 when it launched its Sync infotainment system, powered by Microsoft. The new-look Sync 3 also laid the foundation to support CarPlay and Android Auto, though it took the automaker until this year to announce that it would actually do so. 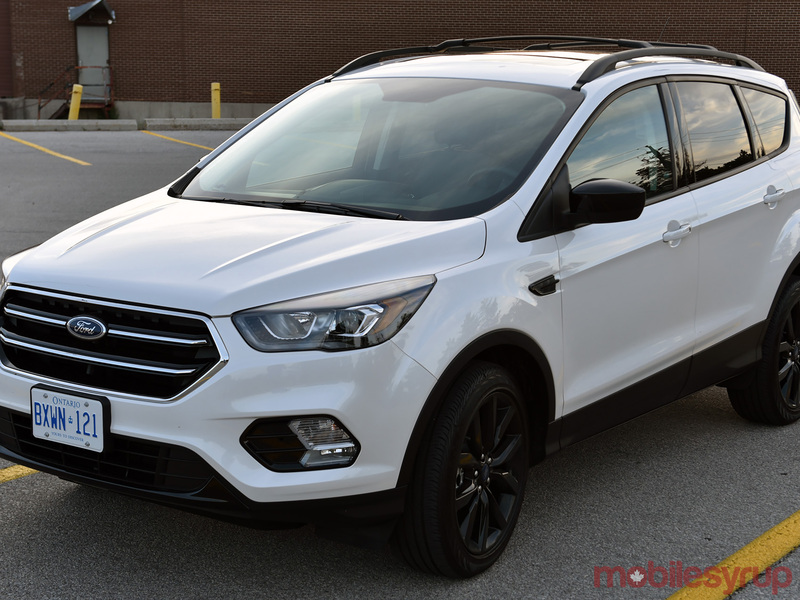 The 2017 Escape is one of the current Ford models offering that compatibility, giving user’s an interesting mix of useful OEM features with the deeper integration Apple and Google help enable. The marriage between the two works fairly well, even if they have to live separately most of the time. Sync 3 represented a revamp for Ford’s aging infotainment system, explaining why the company decided to build it from the ground up with a different architecture. Unfortunately, there is no backward compatibility, so older vehicles running on previous versions of Sync have no chance of upgrading to the newer version. That disconnected line of succession is a tough pill to swallow for consumers who bought or leased Ford vehicles, as late as 2015. And so, this year marks a new start because of Ford’s commitment to rolling out its new platform to the manufacturer’s various models. It also marks a shift in strategy, now that CarPlay and Android Auto are being integrated, combining one of the preeminent factory infotainment systems with those two platforms. Ford is working on alternatives that might claw back some of the ground it ceded to Apple and Google here, but once the cat is out of the bag and drivers get acclimated, it’s hard to see how they may go back. 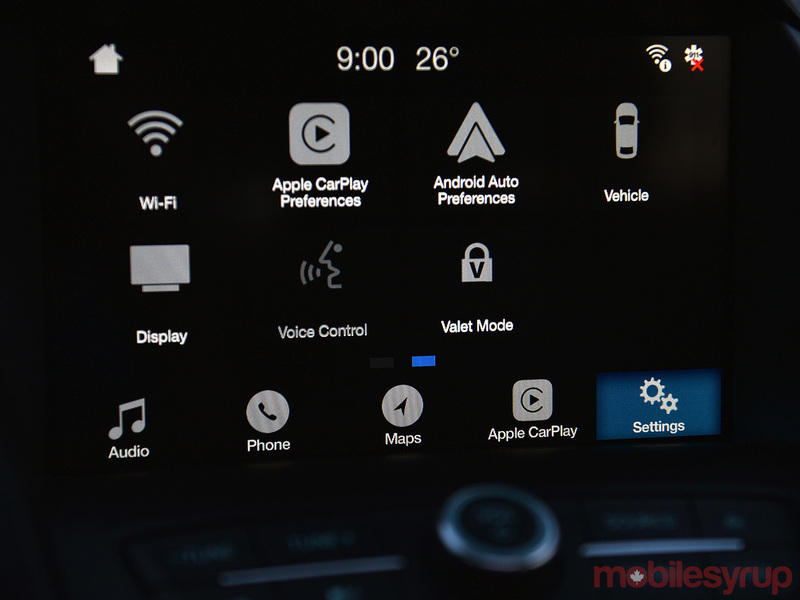 Naturally, the standout change here is adding CarPlay and Android Auto to the existing system. This would have been technically possible last year in vehicles running Sync 3, but Ford predictably waited until after CES 2016 and the kickoff of this year’s Auto Show circuit to open that up. The 8-inch touchscreen is the central part of the Sync 3 system, while the USB port at the bottom of the middle dash acts as the main conduit to interface with it using a smartphone. A 12-volt socket is to the right of that. The middle console has another USB port with an Aux-In jack. Bluetooth is standard, along with steering wheel controls that tie in directly to whichever platform is running. Pairing an iPhone via Bluetooth, Siri Eyes Free will work with a long press of the voice button on the wheel. A quick press would bring up Ford’s own voice activation system. Ford has long been among the best in the auto industry for how that works, mainly because it allows drivers to string commands together. For example, I could say, ‘climate, set temperature, 22-degrees’ in one sequence. Most other voice systems can’t string commands together like that, presenting a back-and-forth question-and-answer process that is needlessly time-consuming instead. There is no wireless charging in the 2017 Escape. And while car itself has Wi-Fi to connect to other networks, I didn’t have a separate data plan to use in the car that other devices could connect to. Setting up CarPlay and Android Auto was a breeze in both cases, despite having to add my iPhone as a Bluetooth device separately. Android Auto pairs the phone automatically. CarPlay has to be disabled in order to use apps through Sync 3. So, while Spotify is integrated into Ford’s system, that’s effectively cut off because CarPlay becomes the default platform after initial setup. The only way I was able to get away from that was to disable CarPlay completely from the settings. The same goes for Android Auto. Once a phone has been set up to run Google’s platform, Sync 3 will always defer to it when that phone is plugged in. Mapping and navigation are also deferred. 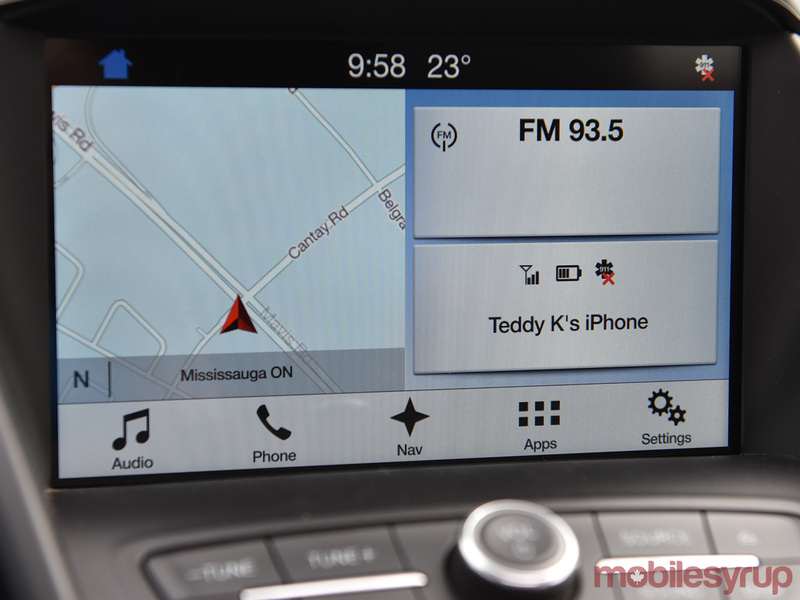 Ford’s built-in satellite GPS incurs no data charges, yet it can only be used if CarPlay or Android Auto are disabled, or the phone is connected via Bluetooth. Caching offline Google Maps now works with Android Auto, so that is a nice reprieve from draining a monthly data bucket, whereas Apple doesn’t offer that for its own mapping app yet. Ford’s own voice control is disabled, too. When either CarPlay or Android Auto are running, pressing the voice button will always trigger Siri or Google Now. I tried a long press to see if it might go back to Sync, but no dice. On the surface, this might seem inconsequential, except that Sync’s voice commands can do things the others can’t. Siri and Google Now can’t tap into the car’s climate control, nor can they navigate to AM/FM or SiriusXM radio. Climate was easy enough because the physical controls were there, but going to a different audio source required tapping the Ford button on CarPlay (bottom right on Android Auto) to go back to the main menu and selecting a different audio source from there. What was kind of neat was that I could have CarPlay running, yet have music stream from an Android phone via Bluetooth. I hadn’t encountered that quirk before in other factory systems supporting both platforms. In cases where CarPlay or Android Auto are disabled, Sync 3 can tap into contacts and music files stored on the phone by voice. Phone calls are a breeze, with contact names or numbers easily understood (though less common names can cause trouble), whereas music files are very hit or miss. Ford claimed to have substantially increased the number of words and phrases Sync 3 would recognize but that doesn’t appear to have translated as much to artists, albums and songs. A key integration here is Spotify, primarily because neither CarPlay nor Android Auto are required for it. Setting it up to appear under Sync’s app section could be a little more obvious. I had to plug in, open the app on the phone from scratch, then wait for a prompt on the head unit screen to add the app on Sync, and then finally add it. Though Spotify can run on Sync from the phone via Bluetooth, it only appears as an option onscreen when the app is running on the phone to begin with. Not always convenient, but at least it isn’t affected when calling or texting someone using Siri Eyes Free. Once done, the music just picks up again on Spotify thereafter. A benefit of this integration is that Spotify can be launched by Sync’s voice activation, and that playlists are indexed, so those can be voiced, too. Siri can’t do either of those things, and Google Now can only launch the app. With CarPlay and Android Auto, the same quirks apply, which was to be expected, given that neither has been updated since automakers began rolling them out this year. Spotify won’t play anything if the app has been frozen for too long, affecting iOS more than Android, but still happens with both. Conversely, it didn’t happen with Sync, and I suspect the reason why is because the app isn’t projecting to the head unit like it does with the other two platforms. Nothing has changed on the third-party app front. Few music services are available, and Google’s list of compatible apps is easier to find than Apple’s. Messaging apps are also fairly limited, but I did like that WhatsApp, Hangouts and Kik are standard on Android Auto, offering alternatives to texting. Even Skype works through it. Apple has been more cautious, and thus fallen behind in the compatibility race. Waze will be coming to the platform soon. No such luck on CarPlay. Calling and texting is easiest with an iPhone because it works the same way if CarPlay is running or not. Using Siri in either case made it simple to do both. Sync can also handle those tasks on its own without having to use Siri at all. 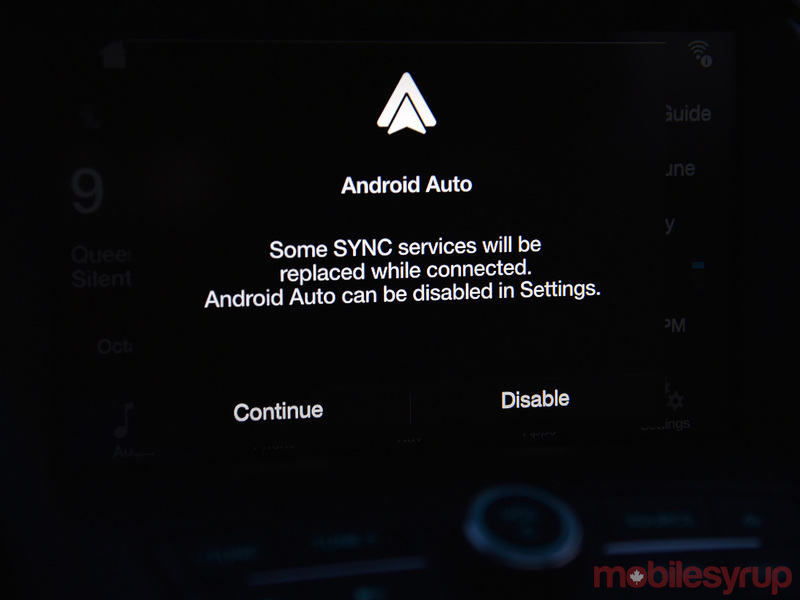 Android Auto is necessary to get the most out texting and messaging with an Android phone, though Sync handles calls perfectly fine without it. Ford’s Sync 3 does largely play second fiddle to CarPlay and Android Auto, but it has decent capability on its own that doesn’t force drivers to switch every time. The result, at least from how it seemed here at the outset, is that this is a marriage that could work. The question is whether or not Ford can move fast enough to update the software to add more functionality the others can’t. This will be vitally important moving forward. Customers buying Ford vehicles will want to see that Sync 3 will remain viable longer-term, because if it doesn’t, this will mark the beginning of the end for the platform. For now, the combination available works, and if all sides keep pushing each other, drivers serve to reap the benefits. 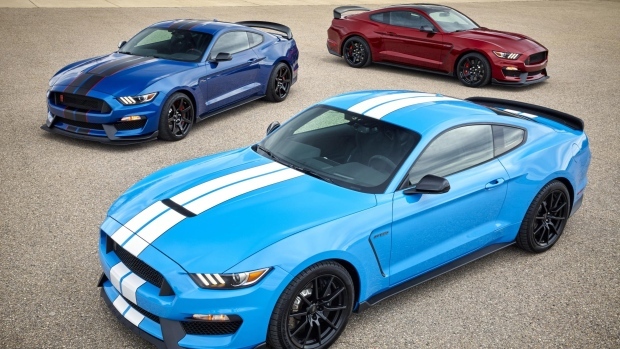 All variants of the latest generation Ford Mustang are in huge demand in the U.S. and beyond but to ensure that the Pony car retains its title as the world’s most popular sportscar, Ford is adding a host of extras as standard to the flagship model. The GT350 is pitched as not only the ultimate version of the latest Mustang but as the ultimate production Mustang in history in terms of its ability to go around a circuit as easily as it can travel around the country. Yet until now, the Track Package was an optional extra. But from June, buyers will get suspension tower braces, a bigger downforce generating rear spoiler, the MagneRide damping system and coolers for engine oil, transmission and differential as standard. The original Mustang, launched back in 1964, is the vehicle that essentially turned the idea of offering consumers a blank automotive canvas onto which extras and personal touches are added into the globally accepted way of selling a new car. However, letting buyers individually ‘spec’ their cars is also a very effective way of judging consumer trends — what’s hot, what’s not — all of which has fed into Ford’s decision-making process for standard and optional equipment packs for the 2017 model-year. 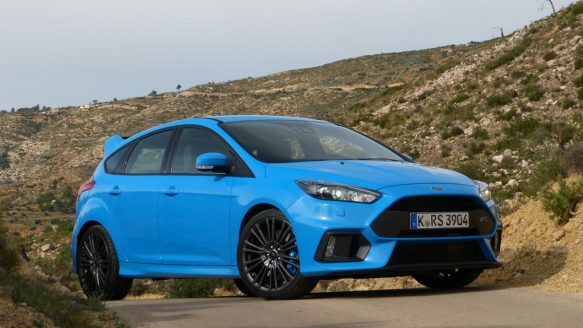 Alongside the track package, from June there will also be a choice of three new exterior paint colours — Ruby Red Metallic, Lightning Blue and Grabber Blue, plus a concerted focus on comfort. As sporty as the GT350 is — a 5.2-liter, naturally aspirated flat-plane crankshaft V8 sending 526hp to the rear wheels via a six-speed manual transmission — some owners are going to want to simply cruise down the boulevard. So the car can be specified with a nine-speaker audio system, latest generation voice-activated infotainment unit and electrically operated leather trimmed sports seats.